Perhaps not such a wise decision to completely revise my journey plan a couple of days into the trip, and decide that I'd be going North to South instead, my only concession to the prevailing winds being "Oh well... how bad can a headwind be?" The answer made itself clear over the next couple of days. There had been no wind on Harris, but during the night at Berneray my tent started flapping like crazy and I woke up every couple of hours thinking "I hope that's going in the right direction" and "I hope the tent pegs hold out". My position by the shore was fairly exposed. Unfortunately, the wind was in pretty much exactly the wrong direction and Friday saw me struggle for fifty miles across mostly flat and exposed landscapes, directly into it. 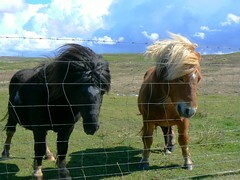 However, I did meet some nice little ponies. My morale dropped to approximately zero at around 35-40 miles, especially when oncoming cars sped towards me along the single track road with very little consideration. It didn't help that the landscape was a bit flat, mostly on not particularly beautiful roads, and at those kind of speeds I get bored quite easily. That's why I'm a cyclist and not a walker. The advantage of choosing a silly direction to cycle in is that you tend to meet slightly more sensible cyclists coming the other way (Or perhaps I'd rather meet the silly ones, I'm not sure). I met a group of ten or fifteen riders coming the other way on North Uist, out of whom two ladies stopped to chat, they turned out to be from the CTC sections of Aberdeen and Bristol. Huge dark clouds threatened for a couple of hours on South Uist, but it never actually rained. I found a Co-op on Benbecula and stocked up on doughnuts and Snickers bars for sugary energy comforty snacky purposes. I finally made it to Howmore, another of the Gatliff hostels, absolutely knackered. 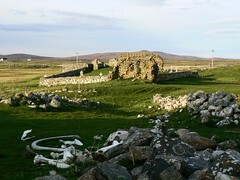 The hostel consisted of a number of blackhouses, some containing the dorms and shared area, one in use as an impromptu bike shed, and several tents parked among the ruins of others. I found an empty spot (again, quite exposed), pitched up and dived into dinner, which was local flaky smoked salmon with broccoli and rice and was absolutely fantastic. The other campers all turned out to be cyclists and we sat around in the hostel chatting into the evening before I retired to my tent and checked the pegs were stuck firmly in the ground in readiness for another windy night. Great story. I like a hostel better then a tent and I love the wind. For me the wind means windsurfing. Have fun on your trip. Hi marco. Yes, I really enjoyed the hostels on the outer Hebrides, lots of cyclists and walkers and people are so friendly. Sometimes it's nice to sit around and chat with a bunch of strangers.